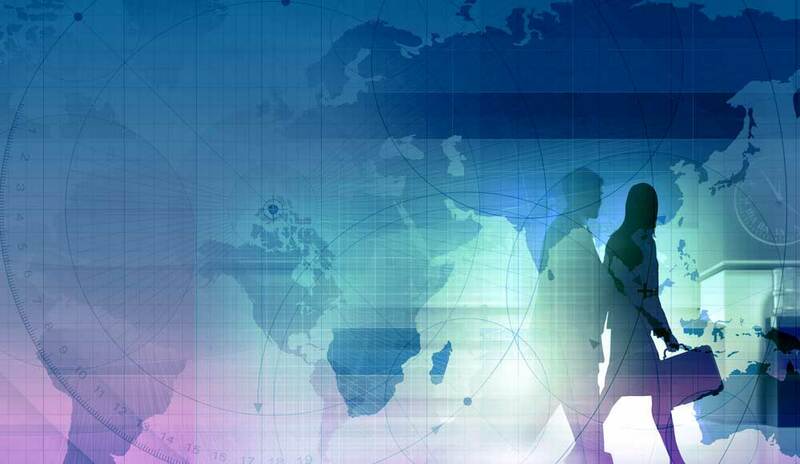 Our experts have helped clients navigate through some of the globe’s largest and most devastating disasters, and we strive to share these experiences with others to promote business resiliency. Creating clear, actionable plans before any event will ensure assets and residents are protected, minimize property damage, and jump-start the recovery process. An effective preparedness and response plan should include critical action steps addressing specific activities before, during, and after a storm. 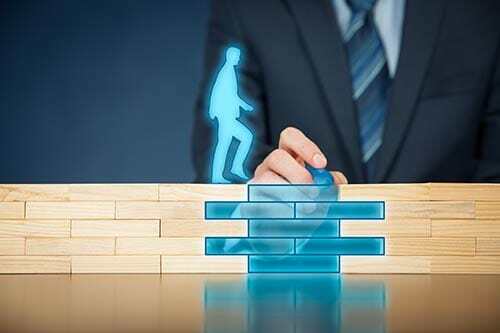 Procor’s expertise and vast experience simplifies the process, and makes organizing and effectuating a response much more efficient and effective. Procor provides unparalleled disaster response expertise and resources, drawn from qualified strategic partnerships across the country. Procor has “front-of-the-line” access to specialist skills, equipment, and materials from preferred vendors for unique events. Priority means you come first when disaster strikes, putting your organization well ahead of others on the road to recovery. Early action ensures that loss mitigation protocols are set, costs and fees fixed. And timely assessments issued to support your business decisions. 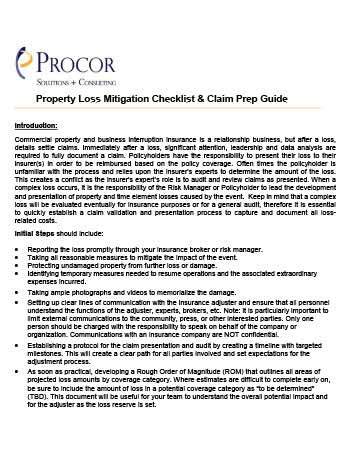 After the loss mitigation and emergency response phase has been successfully completed, a property loss must be thoroughly evaluated, quantified, and professionally presented for reimbursement through either insurance or other disaster aid programs. 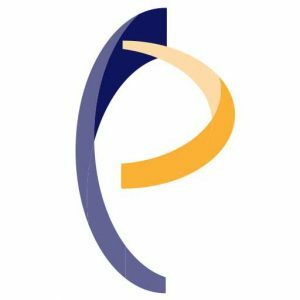 Procor Solutions is the premier complex property damage and claims consulting group in North America. We have handled some of the largest and most complex losses in history. 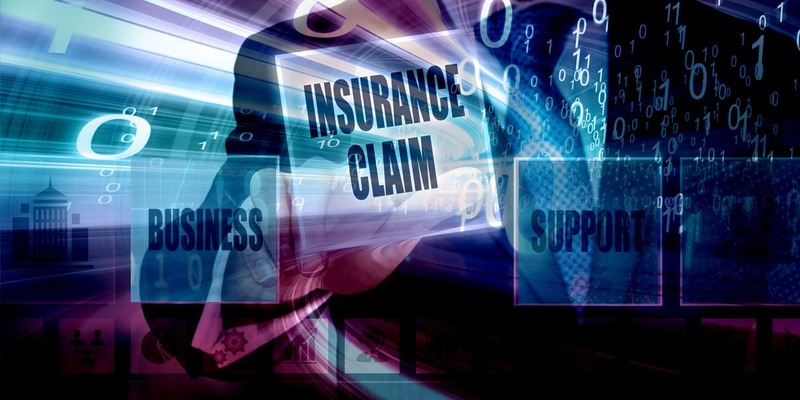 Our management team has successfully prepared and presented insurance claims for more than 25 years. Our ultimate goal is to ensure an accurate evaluation, professional documentation and equitable settlement of each claim. Immediately after a loss, significant attention, leadership and data analysis are required to fully document a claim. Policyholders have the responsibility to present their loss to their insurer(s) in order to be reimbursed based on the policy coverage. 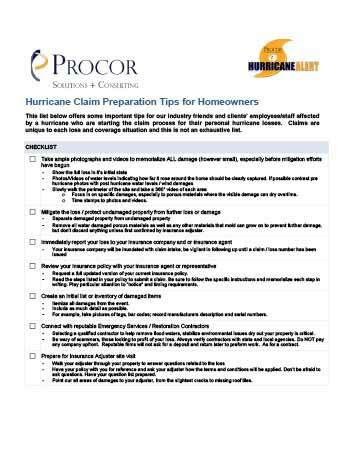 Procor offers some important tips to those who have been affected by a hurricane who are starting the claim process for their personal hurricane losses. According to research, the 2018 hurricane season will be slightly above average. 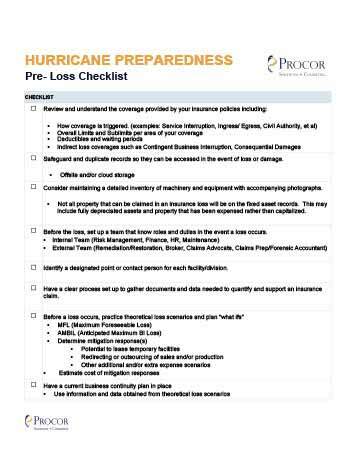 Joe Critelli of Procor Solutions + Consulting has compiled a checklist to assist people preparing for the upcoming hurricane season.